Thing One has a sturdy, expensive bike. It’s made by a company in British Columbia, on the other side of the country from Ottawa. It’s customized. It survives his riding every year on the first bare roads of March through to November’s cold and ice. 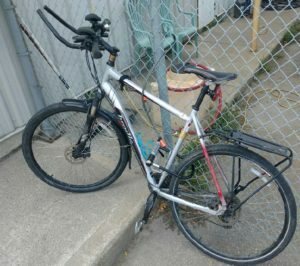 This bike has history: he rode it while volunteering as a first aider at a Canadian Scout Jamboree, CJ13, then bought it for a good price and had it shipped back to Ottawa. All this to say that the bike is not only necessary to him, but highly valued. His precious, even. One humid Ottawa night this summer, Thing One locked up his bicycle to the railing of his front step as usual. At the time, he lived on a quiet downtown street, a few blocks from the ByWard Market. The next day he was out and about in a borrowed car, and only noticed his bike was gone after returning home from work. He experienced the shock of invasion, the anger, the sadness. He headed out in a borrowed car to run some errands, making plans to report the bike stolen, deal with insurance and try not to obsess over the theft. Distracted, he took a wrong turn. As he drove past one of the busiest bike lock-ups in the area, he spotted his bike, locked up with a brand new lock. He pulled into a parking spot across the street, hardly believing his eyes, and called the police. He described the modifications he’d made to the bike, including the glass beads he’d glued on to make parts of it retro-reflective. Because he had registered the bike with Bike Shepherd, he was able to produce a registration number, which matched the one on the bike. By the time the officer with the lock cutters arrived, there were five other officers present to witness the return of the bicycle. A bike getting stolen is a common story, so where’s the good in this? Taking a wrong turn meant Thing One found his bike. This is a great opportunity to be grateful for some pure good luck! The bike was registered, which made proving ownership easy. Thing One didn’t expect his bike to be stolen, but he planned for it just in case. He was prepared. The police helped with something that may seem inconsequential in comparison to violent crimes. But this was important for Thing One: his bike is his set of wheels. We hear about a lot of tension between the general population and the police. It’s reassuring to think of them as just people who were pleased to be able to return someone’s bike and make someone happy. What I take from this story is that sometimes bad stuff happens. But then sometimes, somehow, things work out okay. This time, things worked out for Thing One, and he ended up with a great story, a happy ending — and his bicycle. This story reminds me that we need to pay attention when things work out well, to focus on the positive and savour some gratitude. Hurray for happy endings! Do you have one to share? Leave a comment or send an email to me at Susan at goodbyegrumblings.ca. This is a slice of awesome – call it luck, or kismet, or good fortune – that I’m very glad to hear! I didn’t comment earlier, as I couldn’t think of a story to tell that resolved itself quite that well. Still can’t. But I couldn’t let this lovely story go un-commented. I did enjoy reading it. Hip – Hip – Horray for Thing One, the bike that made its way home, and helpful police! I guess the one thing I have learned over the years is that we’re right where we’re supposed to be. Had Thing One not come to this end of his story he would have had another end instead, and who’s to say that that end would have had any less an impact in its outcome? At the end of the day, we can be grateful for the things that happened and be happy with that! I agree! Finding something to be grateful about and happy about no matter how things turn out helps me get through difficult situations.